At home in Bondi doing a bit of pre XMas spring (?) cleaning in-between playing PS3 games (Mirror’s Edge & Fallout) and present wrapping then came across two very old books on a ‘media’ shelf. I remember picking these two Yearbooks up in a dusty basement of one of the many book shops in Hay-on-wye, near to my uncles (Hereford in the UK). Some years later I used an excerpt of text from one of them in a presentation I gave in 1997 to stick-in-the-mud TV producers, when I was at the BBC to illustrate the parallels between the birth of TV from it’s radio womb and the ‘connected’ web from it’s computer womb. But I just re-read them and noticed many new analogies (games, virtual worlds, social media, mobile) and it got me thinking. 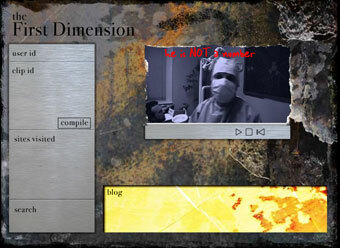 After a new media form is born, it evolves & grows with more and more elements added. Many layers are superficial but most are purely there to capitalise on its success and sell – how will social media evolve into ‘sales space’?. What follows below are two excerpts I dug out from BBC Yearbooks 1946 and 1949 – significant because they immediately follow the worlds biggest conflict but also document the global introduction of public broadcast television – effectively the dawn of ‘live’, visual mass media.These extended excerpts are (as far as I can google) unavailable anywhere, so please re-use, they have lessons for us all 60 years on – and please switch into analogy mode, now! In the summer Of 1939, some 23,000 people in the south of England had their own television sets. They saw the Derby, the Theatrical Garden Paro, the return of the King and Queen from Canada, Peggy Ashcroft in ‘The Tempest’, ‘Me and My Girl’ from the Victoria Palace, visiting celebrities in ‘Picture Page’. Now . . .
From 1936 to 1939 the BBC ran a television service-the first public service of television programmes to be given anywhere in the world. The BBC itself had been experimenting with television transmission for some years before 1936, but from that time onwards the ordinary citizen living in the London area could buy a television set, have it installed in his home, and see, every afternoon and evening, programmes that had real entertainment value: everything from ceremonial processions and top-line sport to studio plays, cabaret, discussions, and films. I love it that there were such a small number of privileged TV viewers in 1939 and they had a staple diet of theatre and live events – which justified this whole move to have live, talking pictures. The thing that strikes me also is the clear focus on what TV actually brought to its audience – sport, events and re-distribution of theatre and film. Sound familiar? This service closed down on 1 September, 1939, at the coming of war. Since then there has been no television in Britain, and more fortunate countries have had a tempting opportunity to catch up. In September, 1943, the Government appointed a committee to prepare plans for the reinstatement and development of the television service after the war. 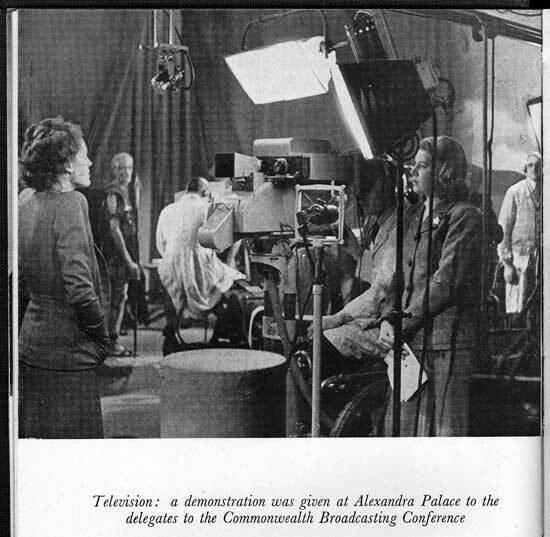 This involved special consideration of extending the service to ‘at any rate the larger centres of population within a reasonable period after the war’; of research and development, and of the question of export trade in television equipment…The committee held thirty-one meetings, in the course of which it heard witnesses from the electrical, radio, and telephone industries, the film producers, the Ministry of Education and Board of Trade, and the British inventor, Mr. J. L. Baird. 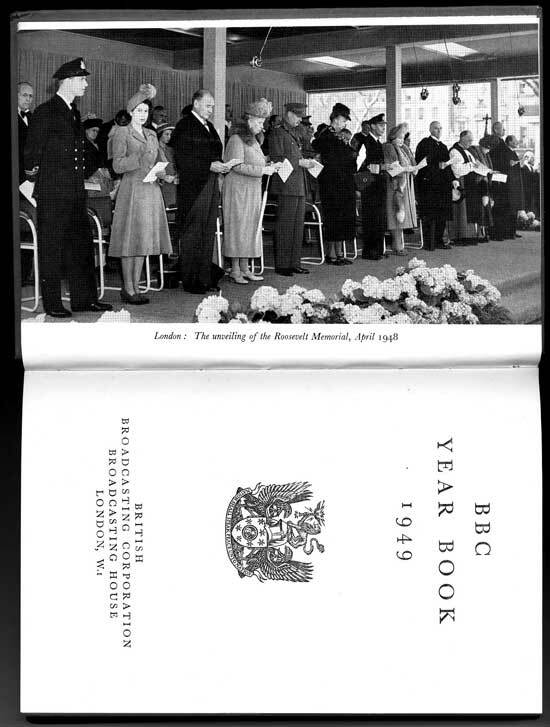 The committee presented its report to the Lord President of the Council on 29 December, 1944 ; the Government indicated agreement with its main recommendations on 9 October, 1945 this gave the BBC its signal to go ahead, and preparations for re-starting the television service were put in hand at once. 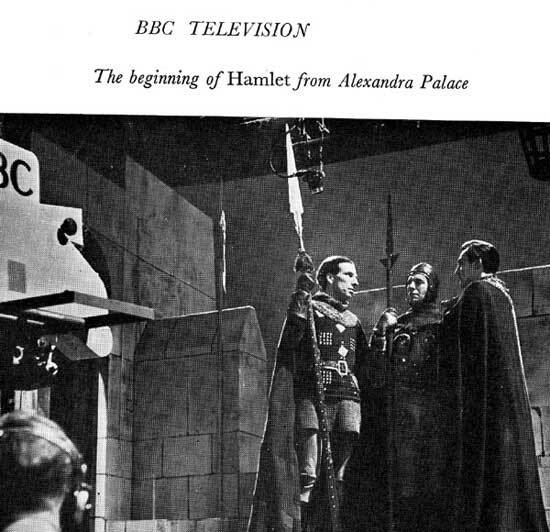 Before the end of the year intensive work was being done at the old television headquarters at Alexandra Palace ; the complex engineering equipment was being tested down to the last detail, studio circuits and lighting were being re-installed, scenery and wardrobe were being sorted, overhauled, and renovated. Much of this work was being done by former television staff who had earned their release from the Services in which they had spent some six years. By the beginning Of 1946, the return of the television service was within sight. It is incredible that the world, or at least the decision makers here, had 6 years to ponder the value of this new medium while the bombs dropped around them. Also Mr Gorham suggested other countries were catching up, a typical sentiment when your on the cusp of something new – once the idea is out there, you have to act and develop it quickly. As all new forms, often a mammoth technological effort is always required, we can only admire those here who turned live radio into live TV. Although the BBC has been charged with the task of operating the television service, this task involves co-operation with many other bodies, from the radio manufacturers, who will provide the sets, to the various Government departments who can supply facilities and also priorities in manpower and materials that are essential before television can resume and expand. And there is the same need in television as in sound broadcasting for friendly co-operation with private interests and professional organizations in the worlds of entertainment and sport, if television is to bring to the viewer the full range of broadcasts in which sight can usefully be added to sound. Granted that co-operation in all these directions is successful, what sort of television service can the BBC provide in 1946? The range of the service will be a radius of about forty miles from Alexandra Palace, on Muswell Hill, the site of the London television transmitter, the top of the mast being 606 feet above sea-level. This forty miles is no rigid limit. Before the war, many people living at a greater distance from London had television sets and became regular viewers. 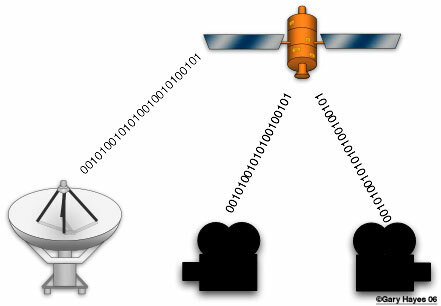 There were frequent reports of reception well outside the estimated range, and occasional reports of freak reception over unexpected distances ; for instance, the television picture from Alexandra Palace was once received in. New York. But hopes that radar research would turn such exceptions into the rule have proved premature, and in 1946 the range of television, as a service to give regular entertainment to the ordinary home, is not likely to extend much beyond the forty miles. It is ironic that it was the medium of radio, those who probably considered TV a nice add-on service who openly helped television in the ‘maternity ward’ – TV was something that was ‘added to sound’ – ring any bells yet? With a range of 40 miles, TV was indeed a minority medium when it was a child. The technical standards used will be those used in 1939: 405 lines, fifty frames interlaced, giving twenty-five complete picture frames per second. This means a picture technically considerably below the definition standards of the cinema, but whereas the cinema picture is viewed on a large screen in a theatre the television picture is viewed on a comparatively small screen in the home, and this difference in conditions of viewing makes the straightforward technical comparison rather misleading. With good lighting at the transmission end and the right adjustments at the listener’s end, the television picture becomes more than a picture-you know that you are watching real people doing real things. The same applies to the size of the screen, whatever it may be. A badly-produced programme may make you feel that the screen is small and cramped, but if the programme is good enough you will look at the screen not as a picture within a frame but as ‘a view seen through a window-and the view may comprise anything from a Boat Race or a shot up into the Big Top at the circus to a vivid bit of acting in the studio, or even a close-up of a conjurer producing a rabbit from a hat. Excellent, the freemium model, get them hooked in a trial still persists today of course – in fact reading Mr Wired’s ‘Freesis’ one would think it is the only model left today? I like the fact that Mr Gorham understands the power of this new medium in it’s natural surroundings (the home) vs the TV showroom. 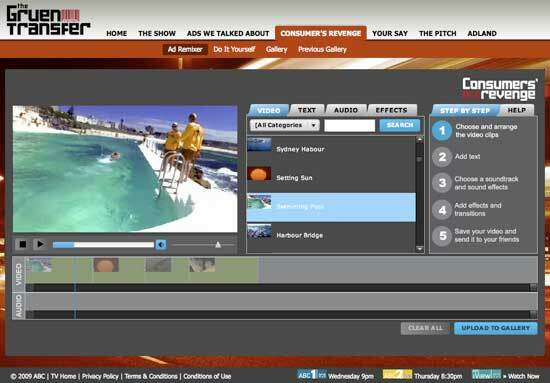 Viewing television is a very different activity from listening to sound broadcasts. The radio set can remain on for hours at a time ; you can enjoy it as background to reading, writing, homework, housework (some people can even enjoy it as background to conversation, darts, or bridge). The television set demands your attention ; you cannot enjoy television from the next room. You must sit facing the set, with the lights down or shaded, and if you are a normal viewer you will find yourself very reluctant to be disturbed during a programme that you enjoy. This puts a limit on the hours that the ordinary viewer can give to his viewing. Broadcasting must go on from morning till midnight, but television is quite another matter, as most viewers will soon find. And so we get to some key definitions and these are typical of what defines new form. Just to reiterate these quotes are from 1946, 63 years ago and to me that last paragraph could have been used to describe the conditions of how to enjoy the latest 3D cinema or PS3 game or social virtual world – it is a lot more immersive than the previous media and therefore you must ‘temper’ your indulgences of it! All things in moderation. Just to bring us full circle, it has not been until the last two years or so that TV viewing is seeing dramatic declines, and so ends its 60 year dominance of our attention – my TV viewing is mostly as ambient background, I know all the formulas, there is very little that is new or innovative. As for programmes, there is no limit to what viewers can hope to see. judging from previous experience, the most popular items will probably be television ‘outside broadcasts’ of sporting events Cup Finals, the Derby, big boxing, tennis, cricket, seen whilst they are actually taking place-and from theatres, with of course big public events such as the opening of Parliament and the Lord Mayor’s Show. These outside shows will always appeal particularly to the new viewer. The old hand may in time come to earmark his evenings primarily for full-length television plays, which were the other great attraction in pre-war days. And then of course there will be variety, cabaret, ballet, fashion shows, demonstrations of everything from cooking to carpentry, talks, discussions, and quiz programmes, art shows, personality interviews, visits to the Zoo, street interviews with ordinary Londoners, jazz sessions, recitals, and films. Briefly, it might be said that television can do many things that sound broadcasting cannot do and can improve on almost everything that sound broadcasting can do. Almost everything ; for there are still one or two categories of sound broadcasting to which sight could add little and from which the exigencies of television production might even detract. What goes around comes around and as I said at the beginning of this ‘diatribe’ the first uses of a major media form (not something like SMS for example) are the ones that will be the ones it returns to as it declines. They are strongest ideas. Look at pay-TV at the moment and compare it with the above paragraph from 1946! When the pre-war staff are back, when Alexandra Palace is all cleaned up and on the air again, when television is again a household word in the London area ; what is the next move ? When will standards be improved so as to give a clearer picture with greater detail, and when will television spread out of London and into the other great population centres of Great Britain ? The answers to these questions are not likely to come in 1946. Nor will they come from the BBC alone. The Hankey Report made certain recommendations as to what the answers should be, but it also recommended the setting up of an Advisory Committee such as had done valuable work in the development of television before the war. The appointment of this Advisory Committee was announced on 27 November, 1945, and its chairman is Mr. G. M. Garro-Jones. Representing as it does the public bodies on whom the development of television into a national service depends, it will be concerned with all these problems of the future. Under its guidance, television has the chance to go forward fast to the stage when it is no longer a comparative luxury for people who live in one part of the country, but an -amenity that can be enjoyed by the bulk of the population, bringing to broadcasting the one element that it has always lacked. …The extent of the listening. public and the fact that the BBC as a public service monopoly has the sole broadcasting access to it provides a dazzling opportunity to undertake the responsibility of informing the public on great issues. But with the opportunity goes the limitation imposed by all systems of mass communication the limitation of non-selectivity. Even the most popular newspaper may well be satisfied if an article it publishes will hold the attention of a million readers. But a million listeners to a BBC talk means that radio sets have been switched off wholesale over the country. A serious analysis of current affairs published in a serious weekly review will have had a most notable and worth while success if it is read by 50,000 readers. But a mere 50,000 listeners to a radio programme in a good listening hour means a colossal flop. Wow. I like the numbers comparison here and how radio dominated the landscape in the forties and fifties. A million radio listeners regarded as a big problem?! This problem of non-selectivity has to some extent, of course, been met by the three alternative national programmes and the regional programmes; but even on the Third Programme the size of the audience whose interest must be held by a serious talk if it is to be successful is colossal by any non-broadcasting standard. One further difficulty, moreover, arises out of the nature of the listening audience. This is the problem of the half-attentive listener. The vast majority of radio listening, certainly to the Light and Home Programmes although probably not to the Third, is family or group listening. In a vast number of cases the radio is turned on as a companionable accompaniment to other activities of a more or less distracting character. Now this may fit in admirably with a background of light music, with a group programme such as ‘Have a Go’ or a ‘Quiz’ in which the listening group can feel that it is participating with another group, or with a popular variety show or play; but it does not provide anything like so satisfactory a frame-work for a serious talk which requires a fair amount of concentration on the part of the listener. Even Francis Williams has indentified the issues we still face today. That of a fragmenting and more localised (or niche) audiences & the wonders of multi-tasking. Radio was always a success because it could always be part of another activity – especially driving the car or house chores or reading etc: Interesting that different programmes though had to be promoted differently because of the ‘expectation’ of how an audience were expected to respond to it. Reminds me forcibly of how we are still expected to act in a cinema, even though the film may not hold our attention. This next section is contains the jewels. And finally there is the problem which faces all those who would communicate ideas or information to the public. This is the problem not only of holding attention but of attracting it in the first place. Here the newspaper has two inherent advantages over the BBC, and one which, while not inherent, tends to exist because broadcasting is a monopoly public service. The first two arise from the fact that a newspaper is making a specific appeal to a particular audience and from the attention it can secure from typographical display. The third advantage arises from a freedom which is, in part at any rate, denied to the BBC, or which it has denied itself out of a sense of responsibility to its monopoly position, and the freedom to build up stars who can attract an audience on their own account on whatever subject, within at any rate a certain range, they are writing or speaking. By trial and error newspapers have discovered that with rare exceptions the expert in a particular subject is not necessarily or indeed usually the person most likely to possess those gifts of lucid and pleasing exposition which will attract and hold the public interest. They have found that skill in communication-what we call style and presentation-are of paramount importance, and that readers can be persuaded to read what would otherwise appear to them a dull or difficult subject if it is handled by a professional writer whose previous writings on other subjects they know, and whose personality and style they find attractive. The American radio companies have made great use of this same fact in building up star commentators. The BBC to a very large extent denies itself this means of attracting listeners in the field of public service broadcasting, although it has employed it, of course, very successfully in the realm of entertainment and in that field has established many commentators with a large personal following. But in public service broadcasting it has been shy, perhaps too shy although one sees the hazards of doing so because of the fear on the one hand that a regular professional commentator on public affairs may come to be regarded as expressing the views of the BBC itself and thus as an infringement of its obligation not to hold or express a view of its own or that alternatively he may by the accident of being a good broadcaster be built up into a political and public figure to an extent that would justify criticism. I have set out the limits within which, as it seems to me, the BBC has to function in its public service broadcasting because it is only against such a background that one can either properly assess what is already being done or consider what might be done. Of course not all the disadvantages are on the BBC’s side. It has the immense advantage that comes from being an instrument of the spoken word which very many people find much easier and more attractive than the written word, and the advantage also that it can present the actual living clash of ideas in debate and bring, when need be, greater actuality to the spoken word by a dramatic illustration. Yet the limitations remain. They are important. They provide the framework within which public service broadcasting must operate, and the BBC is not justly to be criticized, as it sometimes is, for failing to do things which such a framework does not allow. But has it carried out its responsibilities within the realm of public service broadcasting as efficiently and imaginatively as this framework allows? I think that a year or two ago the answer would have been’no’. Now I think it ‘yes’ though with some qualifications. Again the new kid compared with the adult (newspapers) – sound vs written word. Both started with high ideals, grew an audience and so began the bandwagon – a million commercial entities flogging their wares off the back of the altruistic beginnings. I wonder what will happen to the democratised social media form or console games or mobile entertainment or social virtual worlds as they become more dominant – in terms of where we spend most time. Most of those are still tweens compared with TV or radio who have to return to their roots to survive. Will these youngster learn from and respect their elders or carry on throwing stones at the windows of the ‘media form’ retirement home? The excerpts above show that TV was once a kid too, full of ideals, full or promise and had the potential to be a voice. We all have a choice to reflect on the lessons of the past or to mock with closed ears. Which path will you choose? As a closing thought I would like to throw to one of UK’s most respected broadcasting journalists Jeremy Paxman who in a post entitled How can we trust TV fights for the return of trust in what TV should have become. “There is a fight going on for the survival of quality television right across this industry. The recent skirmishes and scandals have not gone our way. As an industry we need to lay out much more clearly what we’re doing and why. Let’s spend less time measuring audiences and more time enlightening them. Despite the last few months, I do not believe that this uniquely powerful medium has been taken over by charlatans. But we ought to acknowledge that parts of it are in danger of losing their redeeming virtues. We need to be open. We need to admit when we make mistakes. We need treat our viewers with respect, to be frank with them about how and why programmes were made, to be transparent.